Recent history is unfortunately full of product launch failures. The Kickstarter culture has presented us thousands of glitzy, feature-rich products that all too often fail to be successfully launched. Poor Partnerships - but they looked so good when we selected them! Failed Certifications in FCC, UL, PTCRB or International Standards - way too late to re-design, and the costs! Under Estimation (Incomplete Bill of Materials, Engineering Costs, Testing) - wow I had no idea that would cost so much! In common, all these problems lead to overruns in both time and money - or said in another way - they failed to fully appreciate the “one to many” challenge. The concept is not difficult rocket science (unless you are in aerospace, of course), but it can be complex. Dismiss this "one to many" challenge and all the nuisances that come with it at your own peril. The dirty grimy minutia is what bites and really hurts when moving a product through commercialization to manufacturability. The 'hindsight is 20/20' and 'if I had only known' situations occur because of a lack of knowledge and experience. With enough money and time of course, all issues can be ironed out, however money is never limitless and time works against your market window. Hallsten Innovations has an electronic-based design team that works with clients in maximizing trade-offs and optimizing production runs. We facilitate the decisions that minimize cost, minimize delivery time, and maximize product quality. These trade-offs are in the realm of Design, Quality, Reliability, Testability and Manufacturability. Knowing the hard limits, and optimizing in light of the business objectives is NOT a simple process even for experienced professionals like ourselves which have commercialized numerous successful products. While not difficult, decisions and choices are often complex. While ignorance is bliss, it is not acceptable in taking your design to production. There is no degree for mastering your own custom product, but you can get ahead of the curve. Start by talking with others and leveraging their knowledge base - and get your hands dirty yourself. How? Join a physical product incubator (like mHUB in Chicago where our Chicago office is located) and shadow / help people who are building their own product. Tear apart similar designs which has been professionally engineered and manufactured – you can learn a lot. Build a Bill of Material for that competitive product you destroyed - you'll thank me later. Having clear estimates of all of the above, for sub-assemblies and end products is absolutely essential. Custom brackets cut by hand from aluminum for a proof of concept can bite you with a $3,000 die purchase price if you forget about such a requirement. How else can you be more confident? Run your estimates by third parties for a reasonable examination. Add significant padding factors in both time and cost. Visit a Contract Manufacturer in person both in the USA and/or overseas. Conducting an in-person audit is a MUST before selection. While Hallsten Innovations is a full service design house, we also use partner contract manufacturers to build product in quantity. One of our core competencies is helping clients move from product design, to manufacturability, to production successfully. Bottom line: Our expertise is a bargain compared to the money you will save and the boost in probability of success. If you want some help, we are here for you and we don't charge for initial napkin reviews! 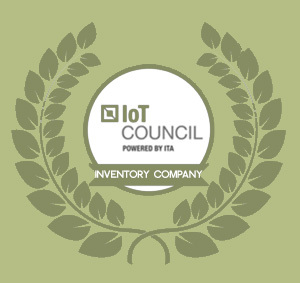 One last thing - we have created a score card that we use internally ourselves to help identify quality Contract Manufacturers that meet the various needs of our clients. 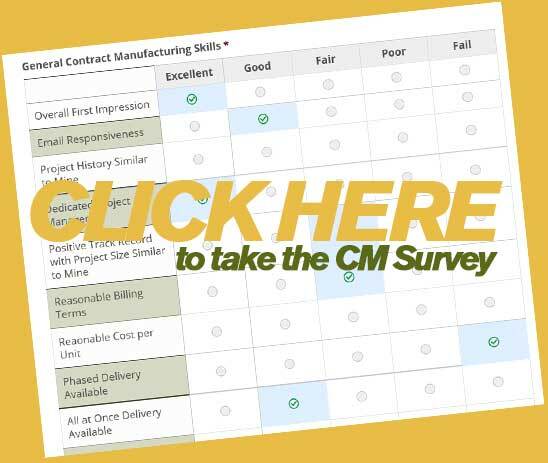 This score card is a simple web form available through the button below that asks 70+ questions about your potential contract manufacturer. Once you finish the survey you will receive your personal results in PDF format to compare and contrast.